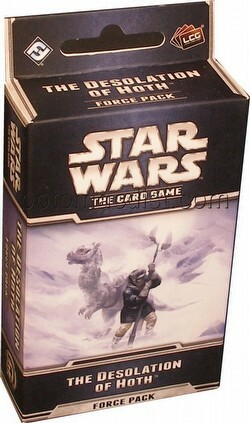 The Desolation of Hoth is the first Force Pack from The Hoth Cycle for Star Wars: The Card Game. Each Force Pack expands the Star Wars universe and increases players' deck-building options with sixty new cards. As a Living Card Game (LCG), Star Wars: The Card Game follows a fixed distribution model, and each Force Pack provides players a complete playset of each new objective, unit, enhancement, event, and fate card it contains. The distribution of cards in each Force Pack differs from the model used for Fantasy Flight's other LCGs. Instead of gaining three copies of each new card, you'll gain ten complete objective sets, including one copy of each Limit 1 objective set and two copies of each other objective set. Inspired by the early scenes from The Empire Strikes Back, The Desolation of Hoth brings you new creatures, droids, snowspeeders, and iconic characters like Wedge Antilles and Darth Vader.